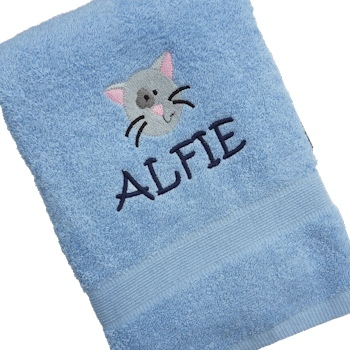 Personalised bath towel featuring embroidered cat motif with any name or initials embroidered on the front. This cotton 500gsm bath sized towel measures 75 x 125cm in your choice of towel colour. Fill in the name or initials you would like embroidered and choose a lettering font style. Fill in the name or initials you would like embroidered and choose a lettering font style. Be sure to check your spelling. Please tell us a thread colour you would like the name sewn in. Personalised Gifts are made to order usually within 1-2 working days.